The Washington Post’s legendary editorial from 1988 says it all: Anyone But Robin Ficker. The only problem with it is that it’s nearly thirty years old. And the scourge of Montgomery County has been plenty busy since then! 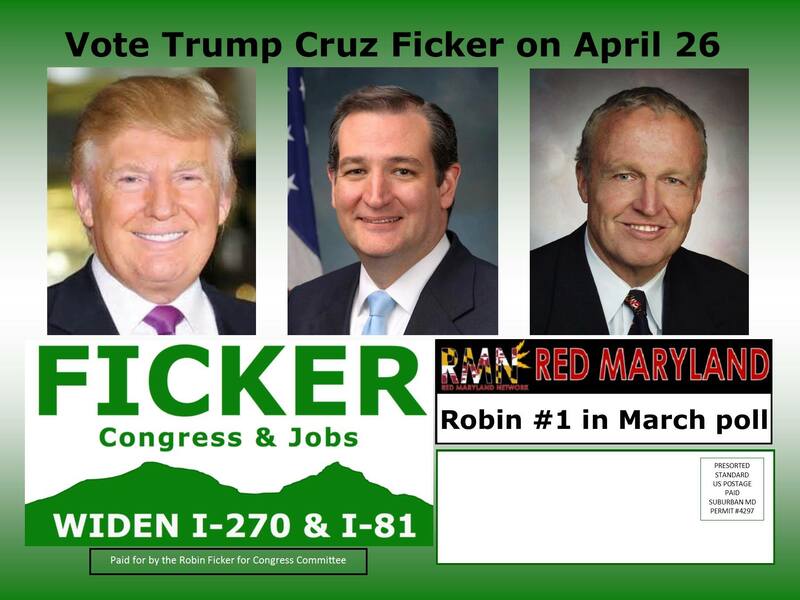 Robin Ficker is well known to elected officials and veteran activists because of his forty-year rampage through the county. But for those who have not yet encountered him, or have been exposed to him only through his most recent attempt to pass term limits, here are Four Facts about the man local politicians hate the most. If there is ever a Heckler Hall of Fame, Robin Ficker would be a charter member. He has all the tools of heckling: a booming voice, boundless energy, a rapacious hunger for attention of any kind and absolutely no fear. For many years, he was indisputably the Number One heckler in the NBA, harassing opponents of his beloved Washington Bullets from directly behind their bench. Ficker once explained the key to his heckling technique to ESPN. It’s important to really read up on the opposing team and follow the game very closely, so that you’re conversant with the psychological weaknesses of the other team,” advises Robin Ficker, the Bethesda-based attorney who was once the NBA’s preeminent heckler. Ficker never cursed at players or used sexual or racial insults, but he was still massively disruptive. He read passages of tell-all sports books to players and coaches, making sure to focus on the inflammatory parts covering them. His use of props and bullhorns caused some players to use ear plugs and provoked the Golden State Warriors to throw towels and Gatorade at him. Legendary former Boston Celtics boss Red Auerbach called Ficker “a disgrace” and urged the Bullets’ owner to revoke his tickets. The NBA passed a rule to forbid fans from heckling teams during timeouts, taking away one of Ficker’s greatest weapons. And in an unholy alliance, former Phoenix Suns forward Charles Barkley even flew Ficker out to a playoff game to heckle the Chicago Bulls. Ficker gave up his season tickets in 1997 after his seat was moved away from the court, but he continues to heckle at University of Maryland wrestling matches. Ficker shows off his heckling skills. Ficker’s only win was his 1978 election to the House of Delegates, which was reversed four years later. He did run for Congress once in the meantime, a race that saw him fighting with a female debate moderator for a microphone. Ficker shows off his debating skills. Ficker is equally prolific at placing charter amendments on the ballot. Most of them deal with tax restrictions, but he has put term limits on the ballot at least twice before. Ficker excels at this because he has the energy necessary to gather signatures at every conceivable public venue, and in a county of one million, ten thousand people can be found to support almost anything. After decades of anti-tax failures, Ficker succeeded in passing a unanimous, nine-vote requirement on the County Council to break the county’s charter limit on property taxes in 2008. The council met that hurdle in approving a nine percent property tax hike this year, giving new momentum to Ficker’s current term limits ballot drive. Early in his political career, Ficker actually got elected to the House of Delegates as a Republican from District 15. Annapolis quickly regretted it. His colleagues said, “they have never met anyone who lives for publicity the way Ficker does.” His “long, protracted questions, sometimes about the most minor issues” provoked “a considerable amount of exasperation at times.” The Post noted that his “gadfly politics and long speeches often emptied the House chamber in Annapolis.” Speaker Ben Cardin said this of Ficker: “I would be glad to make a contribution to Robin’s campaign… As long as he runs for the Senate or Congress or anything but the House of Delegates, I stand ready to help.” Possibly his only meaningful accomplishment was to help kill D.C. voting rights. Ficker’s name on a bill was regarded as the kiss of death. Even his support could kill a bill. One lawmaker moaned, “The bill is dead…. I mean, if I had a bill I wanted killed the first thing I’d do is persuade Robin Ficker to speak for it.” On another occasion, a Delegate begged Ficker not to speak on behalf of his bill. Ficker did it anyway. The Delegate retaliated by breaking his microphone. There were many stories about Ficker during his four years in the statehouse. Here is one from the Post. Ficker shares a suite of offices with fellow Montgomery Republicans Constance A. Morella and [Luiz] Simmons. When the three moved in, Morella’s name, as the top vote-getter, was on top. Ficker switched the names. Somebody switched them back (Morella says she knows nothing about the incident.) Ficker switched them again. When they were switched one more time, Ficker had the final word–he bought a tube of Krazy Glue and glued his nameplate in on top. 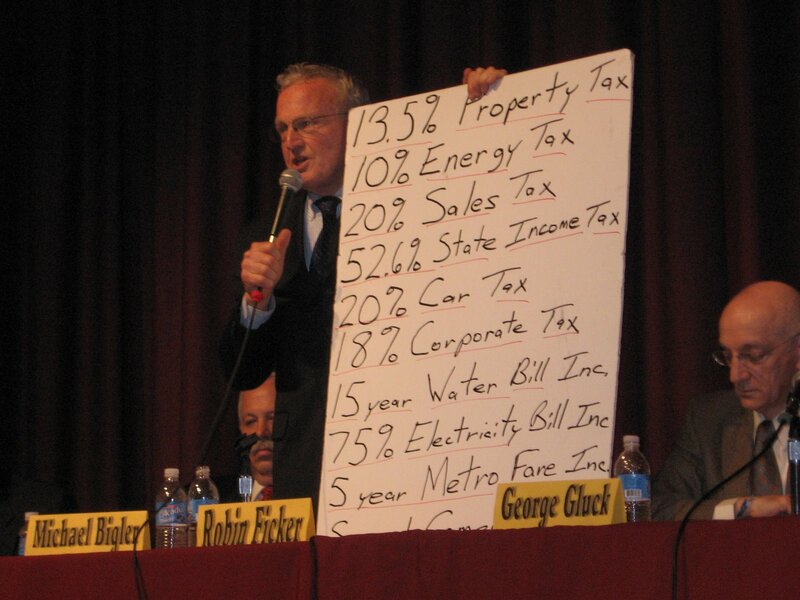 Ficker running for Montgomery County Council in 2009. It’s hard to track all the Ficker Incidents. Most of them have to do with his misconduct as an attorney. Should we begin with 1988, when Maryland’s Attorney Grievance Commission accused Ficker of an ethics violation for advertising his expertise in palimony suits even though the state does not allow palimony? (He was later cleared, but a judge said the ads were in “bad taste.”) Or how about 1990, when the Court of Appeals reprimanded him for failing to show up at the trials of two clients? In 1995, the Attorney Grievance Commission slammed him when he “allegedly left clients stranded without representation in court and in one case sent a novice lawyer who was unfamiliar with the case into the courtroom.” There is also Ficker’s 1996 conviction of battery and malicious destruction of property in connection with a traffic accident involving a pregnant woman. The woman testified that Ficker “exploded in anger,” “was out of control,” and broke her sunglasses after he bumped her car and she tried to get contact information from him. After Ficker appealed, he was acquitted of destruction of property and the battery charge was dropped. Ficker’s law license was suspended in 1998 and 2007 for violations of competence and diligence. Here’s what the Court of Appeals wrote after the second suspension. As we observed initially, this is the fifth time that Ficker has run afoul of his obligation to manage his office in a proper manner. He was warned twice by this Court, in 1990 and in 1998, and, despite his claimed improvements, seems not to have learned enough from those warnings. As the result of his cavalier attention to proper office management (1) one client (Robertshaw), facing incarceration, was virtually abandoned until the eve of trial and then was represented by an associate who had not read the entire file, who was unaware that his client had two prior convictions, and who first presented the available options to her in the lobby of the courthouse on the day of trial, (2) another client (Paulk), facing criminal charges that could have resulted in incarceration, was abandoned on what she assumed would be a trial date and which, only by fortuitous circumstance unknown to her or Ficker, had been limited to an advice of rights proceeding, and (3) a third client (Ponto) ended up having an arrest warrant issued against him. We see in these violations an inexcusable lack of concern on Ficker’s part for the welfare of his clients, an unwillingness, after four warnings, to make the necessary improvements to his office management. Accordingly, we believe that the appropriate sanction is an indefinite suspension from the practice of law, with the right to reapply for admission no earlier than one year from the effective date of the suspension. Would you want to be represented by this man? A Ficker mailer from his recent campaign in Congressional District 6. So given all of the above, why did Ficker’s anti-tax charter amendment pass in 2008, and why is his latest term limits amendment favored to pass? The answer is that MoCo’s elected leaders overreach, especially on the issue of raising taxes. By and large, the county’s electorate appreciates the role of government in solving problems and maintaining a high quality of life. But county leaders have approved six major tax increases in the last fifteen fiscal years and voters are getting tired of it. That’s why they voted to limit property tax hikes in 2008, and the County Council responded with a nine-percent increase this year. It’s almost impossible to give someone like Ficker the political high ground, but that’s what has happened. And it appears that elected officials will pay the price.